I leave for London in 15 short days where I will spend the next few months studying and traveling throughout Europe. I have spent countless hours looking for packing lists and other advice on Pinterest so I decided to share what I learned with all of you! I have some experience packing for Europe because I spent three weeks there a few years ago. However, three weeks is a tiny amount of time compared to a whole semester. 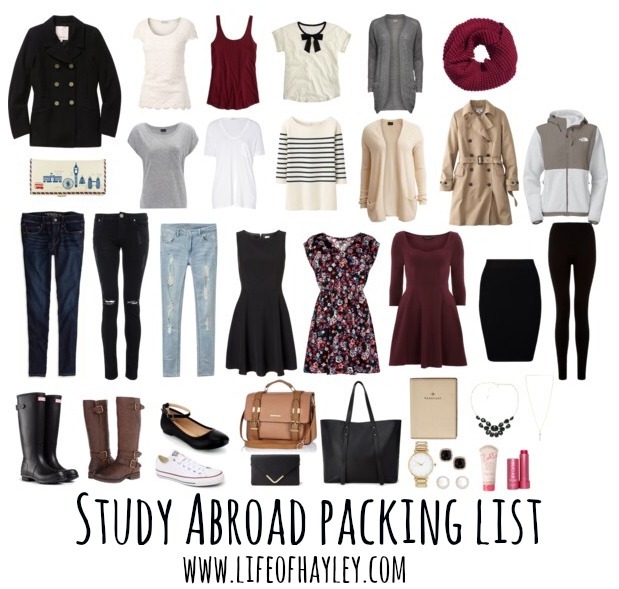 I used my previous experience as well as the advice/research that I found online to create my own packing list. I hope this helps some of my fellow travelers! As you can see, I am packing mostly basics that I can mix and match to create different outfits. I am planning all of my outfits based on three colors-black, blue, and cream. I definitely recommend picking a color scheme and choosing your clothing and accessories around that. Also, don’t bring any clothing that you don’t wear at home because you won’t wear it abroad either and it will just take up precious weight in your suitcase. I hope this helps as you plan your next adventure! Please feel free to ask any questions and let me know if there’s anything that I forgot! I am getting anxious to begin this journey and can’t wait to share it with all of you! Love this post! I always enjoy visiting! Check me out if you have time! I love reading other people’s packing lists, it always gives me extra ideas! Is melatonin just part of a personal prescription or is it used for something when traveling? Thanks for replying! That sounds awesome, I think I need to find some for my next flight! Sleeping on planes is so hard!